In the Texas production studio of Wonderful Radio London International (WRLI), as the new Don Pierson inspired offshore station and its syndication project were called, was a 1968 Yearbook published by Encyclopedia Britanica. Inside that publication we happened upon five pages which had been written by U.S. Supreme Court Justice Hugo Black. Black's article for Encyclopedia Britannica traced the development of freedom of speech through the ages until it became a part of the written text forming the First Amendment to the United States Constitution. But what leapt off the page for us, was his claim that America owed its most basic freedom to an Englishman named John Lilburne. It seemed to bring our question about rock and roll restrictions on the British airwaves, full circle. We wanted to know more about English censorship laws and its Court of Star Chamber. We discovered that this Justice had previously embraced the story of John Lilburne, following an introduction to him by his daughter, who thought that one of her college textbooks featuring Lilburne, would be of interest to her father. That introduction began a life-long fascination for Hugo Black, who over a ten year period began footnoting within many of his written U.S. Supreme Court Opinions, Lilburne's earlier appearances before the English Court of Star Chamber and other judicial bodies. While he was still a member of the Court, Black gained support for his championship of Lilburne from two other Justices, one of whom was the Chief Justice who wrote the majority opinion in Miranda v. Arizona, in part based upon and citing a 1637 trial of John Lilburne. That case grew out of a press censorship law which accused Lilburne of importing 'pirate' books into England. The Appeal of Ernesto Miranda was in its turn based in large part upon a protected right under Fifth Amendment to the U.S. Constitution, and a resulting academic book traced the origins of that Amendment to John Lilburne, and earned for its author a Pulitzer Prize. Now we were learning about the linkage between 'pirate' publishing, and 'pirate' broadcasting, which in reality was a misuse of the word piracy, since nothing was being stolen. In practice we were receiving a de facto self-education about the British use of censorship laws to preserve a tightly controlled political electorate. 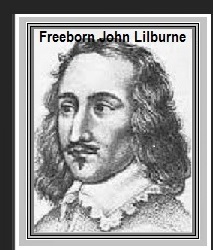 Hugo Black subsequently claimed John Lilburne as his role model because Lilburne had championed freedom of speech, and his struggle against English lawmakers was then embodied in amendments to the foundational U.S. Constitution. Over a period of many years Black added his own footnotes and references about Lilburne when rendering written Opinions that were then issued from the Supreme Court bench. However, Hugo Black was not espousing a left-wing cause, he was claiming that the U.S. Constitution developed out of Lilburne's proposed constitution which he had written, with others, during the time that England and later Scotland, became unified within a single republic. That took place during those turbulent years following the abolition of the monarchy in both England and Scotland when they both subsumed into a new unitary republic, and that was in the century before the USA became a nation. At that time little had been written and published in the popular U.S. mainstream press about Lilburne, and he was not exactly a household name in the U.K. In fact, a primarily English notarity which had become attached to his name at that time, seems to have resonated from left-wing groups championing causes that were ideological anathema to the majority of Americans. But around the time we became interested in this subject, other groups on the right and on the left of the American political spectrum had also begun to publish material relating back to John Lilburne. In the middle, and especially within American High School textbooks, which in large part were controlled by publishing companies with British connections, there was a void. Meanwhile, in England, the story of Lilburne remained rooted in its past, and, seemingly, having no relationship to the history of Scotland. While in America, although Constitutional scholars were scribbling away about the historical connections to England, no one seemed to be drawing any attention to the fact that in 1985, none of the inhabitants of England, Scotland or Northern Ireland were protected by a written constitution.